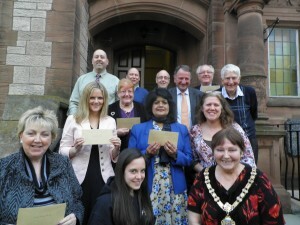 Large grants have also been awarded by the Town Council to support the following major events in 2013: Colwyn Bay 1940’s Festival, Prom Xtra and Access all Eirias. The Bay of Colwyn Town Council is delighted to announce the winners of the Bay of Colwyn Volunteer of the Year Awards for 2013. 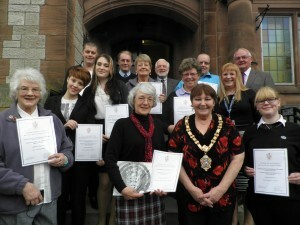 These were decided by the Volunteer Awards Committee, which includes representatives from Conwy Voluntary Services Council, Colwyn Bay Civic Society and Colwyn Bay Horticultural Society. Nominees were invited to the Town Hall for the presentations on Monday evening and the winners of each category were presented with a slate plaque and certificate by the Town Mayor, Cllr Mrs Viv Perry and Cllr John Davies, Chairman of the Volunteer Awards Committee. Highly Commended certificates were also presented to the following volunteers/groups by The Mayor, in recognition of their outstanding contributions: Peter Abrahams, Elise Johnson, Shirley Bellis, Alan Pritchard, Circle of Friends Fundraisers, CAIS Peer Mentoring Scheme, WRVS. Although there were no nominations this year in the Young Persons (under 25) category, the Town Council is aware that there are many young people regularly carrying out voluntary work in our community. It therefore took the opportunity to present ‘Highly Commended’ Certificates to four young people from Ysgol Eirias and Ysgol Bryn Elian: Kayleigh Griffiths, Lauren Rossington, Shannon Stewart and Olivia Wilcock, who have been regularly attending Council meetings in a voluntary capacity and advising the Council on matters relating to, or affecting, young people. Hopefully we can encourage more nominations for this category for next year’s awards. There were also no nominations this year for the ‘Green Volunteer’ category and again, nominations are particularly encouraged for this category for next year’s awards.